Summary: If nothing else, REC’s results are consistent — once again this specialist currency manager revealed stagnant financial progress, a lack of new business and a dependence on a handful of major clients. Nevertheless, the group sports high margins and cash-flush accounts, while the P/E could be as low as 7 thanks to the weaker GBP. Talk of potential special dividends unfortunately remains talk for now, but at least the ordinary payout yields 5.2%. I continue to hold. REC used these results to amend how it discloses its effective assets under management (AUMe). The group introduced ‘Multi-product’ as a new product classification, which covers clients whose mandates involve both currency hedging and “return-seeking” components. However, deep in the small-print REC did admit (my bold). So it appears that the $0.8bn reduction may be due to certain Multi-product AUMe not earning any fees. Given REC’s stagnant financial performance throughout the last five years, I suppose I should not be too surprised to learn some AUMe was not generating any income. At least this change to AUMe disclosure does not affect REC’s revenue or profit — past or future. REC’s first- and second-quarter updates had already indicated these results would not be spectacular. Reported revenue gained 7% and operating profit jumped 23% — albeit due entirely to foreign-exchange movements and investment gains. Excluding those non-trading items, underlying client fees fell 3% to £10.6m while underlying operating profit slipped 2% to £3.5m. The lack of positive progress was due to clients withdrawing higher-margin Dynamic Hedging mandates, which could not be shored up completely by the extra money arriving into the lower-margin Passive Hedging strategy. But my own fee-rate calculations differed to those that REC presented. The differences may look small, but they do carry a sizeable impact on REC’s possible earnings. More on that a bit later. If these positive returns can be sustained during the second half, the current year will be the first since 2013 during which all of REC’s strategies will be able to boast a successful year. (I note REC’s underwhelming Currency Alpha product was closed during the half). “We have seen a growing level of new business discussions, in particular towards the end of the period. This can be attributed to marked currency volatility on the one hand, and positive performance across all return-seeking strategies on the other. There is a welcome degree of diversification in the objectives clients are looking to meet. Client and consultant engagement ranges across passive hedging, active hedging and return-seeking objectives, and in some cases combinations of these. One day I trust the planets will finally align and REC will enjoy a notable influx of money from a broad spread of new clients. The last time such an influx occurred was 2007/8. 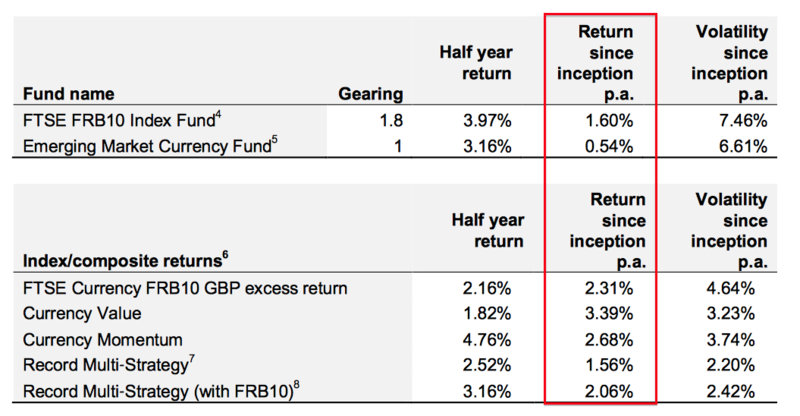 I can’t fault the fundamentals of REC’s accounts. In particular, the H1 operating margin was an impressive 33%. Cash conversion also remains terrific, with this half-year once again witnessing very modest sums spent on tangible assets and working capital. Cash now stands at £36.1m, which after regulatory capital of £8.5m and third-party-owned investments of £4.2m comes to £23.4m or 10.6p per share. The balance sheet carries no debt and no pension complications. Sadly there was no sign of REC returning any of its chunky cash pile to shareholders. REC held the interim payout at 0.825p per share and projected the full-year dividend should be maintained at 1.65p per share. REC continues to be dependent on a small number of large clients (my bold). Also worth considering are new regulations that involve “mandatory variation margin” — which I believe will require participants that use currency derivatives having to stump up extra collateral. “Regulatory change continues to be a major theme in the foreign exchange markets. This half year saw the first implementation of mandatory variation margin rules amongst bank counterparties, with the effects on our clients expected to be felt from the first calendar quarter in 2017. As previously reported, we continue to be frustrated by differences in rules across jurisdictions. We are nevertheless committing significant resources to managing the impact of these rules on our clients, and to seeking to mitigate any adverse consequences for our business. After standard 20% tax, my latest sums suggest earnings could be £6.9m or 3.11p per share. Just before Brexit I was forecasting 1.88p per share — which just goes to show the effect the weaker GBP may recently have had on translating REC’s substantial non-GBP income. REC’s market cap at 32p is £70.8m, which adjusting for my aforementioned surplus net cash and investment figure of £23.4m gives an enterprise value (EV) of £47.4m or 21p per share. Dividing that EV by my 3.11p per share earnings guess gives an underlying P/E of just 7. Even if you assume all of REC’s cash is not surplus to requirements — and I must admit, the fact REC continues to hoard cash might suggest it is all needed to reassure clients — then the P/E remains modest at about 10. Meanwhile, REC’s anticipated 1.65p per share dividend supports a 5.2% income. Congratulations, it looks like the market has finally started to see the value here. I had bids of 25p in for this one a few months back and got no shares at that price. I should have just paid up. The strong balance sheet and good cash generation give you some nice downside protection. Notwithstanding the stabilisation of the business, what is potentially interesting though is that there might be some potential rocket fuel under this one as well. Yes, the price has risen of late. I think that is more to do with the weaker GBP and its effect on REC’s earnings, than any re-rating of the business. I think any of my past speculation about Currency for Return coming back is somewhat idle speculation :-) The division has been in the doldrums for years and client numbers are currently at a low of 11. Still, this could always be the bottom. There has been some life in currency markets during the last two years, with the CHF losing its EUR peg, the first US rate hike last year, and now Brexit. I think we will always be closer to the ‘great turning point’ for REC, but just how long we will have to wait is hard to say. In the meantime we can only hope REC’s larger clients do not jump ship. That said, REC’s currency strategies are all showing positive returns and the management narrative suggests growing interest in the group’s services. So there is hope that high-margin client money can be secured soon. Do not worry, if REC ever gets $10bn AUMe for Currency for Return, then I will be sure to remember your post! There were no major developments reported during the three months to 31 December 2016. Total effective client assets under management (AUMe) advanced by $1.6bn to $56.6bn, but in sterling terms gained £3.4bn to £45.8bn. At least clients decided once again to place extra money with REC —- this time they deposited the equivalent of $2.2bn during the quarter. Client numbers advanced by 3 to 64 to a fresh six-year high. Although the mandates concerned are not too significant, it’s such a shame REC continues to lose business. …it seems clients are still happy to jump ship. Just when will REC decisively add new clients while at the same time keep its old ones? Less my guesses of £6,800k for staff costs and £4,616k for other costs as noted in the Blog post above, then less the 30% profit share (of £4,013k), I arrive at an operating profit of £9,364k. Taxed at 20% gives earnings of £7,491k or 3.38p per share. With the share price at 39p, the EV is 28p per share and my cash-adjusted P/E comes to 8.4. That 8.4x multiple assumes REC’s cash pile is surplus to requirements. I mentioned in the Blog post above that perhaps all the cash is needed to reassure clients and therefore is not surplus to requirements. If the cash is needed, then the possible multiple rises to 11-12. At least my 3.38p per share guess easily covers REC’s anticipated 1.65p per share dividend, and can now probably fund a special payout that the group has mentioned within its recent results. 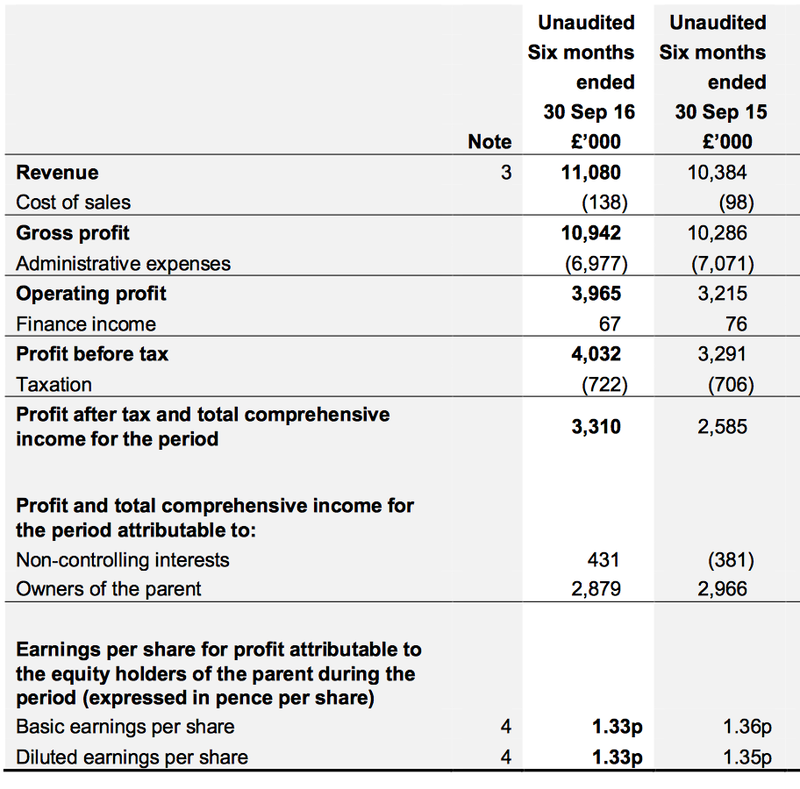 A 1.65p per share payout offers a 4.2% income at 39p. All told, the elusive wait for some substantial client wins continues for at least another three months. This update was a tad disappointing, with client withdrawals — some previously announced, some not — emphasising how this business continues to tread water at best. Total effective client assets under management (AUMe) advanced by $1.2bn to $58.2bn during the 3 months to 31 March 2017, and in sterling terms gained £0.8bn to £46.6bn. It appears the six Passive Hedging clients with $0.7bn AUMe did leave, but took $0.6bn. Meanwhile, the Dynamic Hedging client representing $0.3bn AUMe who was planning to leave “with timing to be determined” is still to leave. Sadly this Q4 update revealed a Multi-Product client has also withdrawn $0.9bn AUMe, and a $1.2bn Passive Hedging mandate is about to disappear as well. At least an extra £1.0bn AUMe of Passive Hedging money was placed by clients during Q4, although Passive Hedging is by some distance the group’s lowest-margin division. As I wrote three months ago, it’s such a shame REC continues to lose business. …it seems clients are still happy to jump ship. As before, just when will REC decisively add new clients while at the same time keep its old ones? Less my guesses of £6,800k for staff costs and £4,616k for other costs as noted in the Blog post above, then less the 30% profit share (of £3,657k), I arrive at an operating profit of £8,533k. Taxed at 19% gives earnings of £6,911k or 3.12p per share. With the share price at 40p, the EV is 29p per share and my cash-adjusted P/E comes to 9.4. That 9.4x multiple assumes REC’s cash pile is surplus to requirements. I mentioned in the Blog post above that perhaps all the cash is needed to reassure clients and therefore is not surplus to requirements. If the cash is needed, then the possible multiple rises to almost 13. At least my 3.12p per share guess continues to easily cover REC’s anticipated 1.65p per share dividend, and can now probably fund a special payout that the group has mentioned within its latest results. A 1.65p per share payout offers a 4.1% income at 40p. All told, the elusive wait for some substantial client wins continues yet again for at least another three months. Thanks for your thoughts, nice level of income at least!